That's a bootleg. Either it's a home recording of one of the concerts, or a rip of the 2-LP (CD) releases. You can even see the fold in the LP's poster on Karen's sleeve. Not to worry, it was only £5, but I should have known really. Well, in the end, I couldn't resist, I had to buy one, sorry. But, yes it IS. Anyone who supports people who steal intellectual property are in fact aiding and abetting the "criminals." By buying the article, you're keeping the seller in business, and allowing their business to continue. All they have to do is to use a non-copyrighted image and they can sell as many as they wish. David A and John Tkacik like this. Since the damage has been done, maybe a paypal donation to Chris T. is in order. What I find interesting here is that ANYONE can have a watch with custom artwork made. There are plenty of online businesses that specialize in customized items, so if you want a shirt, a clock, a frisbee, a mug, a garbage can, for that matter, there's surely an online entity that can make it for you. Some of the less scrupulous out there will allow copyrighted images and logos, others will not. But since these items would be for your personal use, I see no harm in having them made for you. It's when YOU turn around and sell them to others that the problem begins. But, I'm just a moderator here, not your conscience. People are gonna do what they're gonna do. I was reading about Your Navy Presents. I’ve been searching for that a long time too. Seems I always miss out. The rumor was that Cinderella Rockefella was going to be the follow up single, to Ticket, before Herb asked Richard to record Close to You instead. Smart choice!!!!!! Still it’s an interesting tune on that lp. I’ve never heard that rumour. I don’t think they even recorded a studio version of that track. From all that I’ve read and heard, it was Help! which was being considered as a follow up. I believe it was Steve Harvey or Jim Pierson, that told me that back around 1975-78, after taking about the Your Navy Presents lp and the fanzine Steve was writing called Downey Soft. Not sure of the exact year. Hang on, what`s the difference between buying this watch that you suddenly have an issue about, because the picture just happens to have come from someone you know and all these bootleg albums that get sold all over the internet, that nobody bats an eyelid about!!!! Whoever that image belongs to needs to report it to Ebay and get it removed, simple as that, but if they don`t and this guy sells 500 watches, then don`t rag my face off about it, whiter than white brigade. I have always been against the sale of bootleg albums, books, any intellectual property that's been stolen. This case is perhaps a little more gray area because I have no idea whether or not Chris Tassin, who I only know through this forum, has in fact copyrighted his drawings. That's his business and not mine. If he hasn't actually gone through a legal copyright process, then his drawings may be seen as fair game to anyone who uses them. Recordings are all copyrighted, and only official ones should be bought and sold. But, as we know, there are many unscrupulous individuals out there who are good at making things that LOOK official. It is these that I and this website have always railed against. David A, Joeyesterday and Chris May like this. So, the drawing is a copyrighted, published work. It is definitely protected under U.S. law. Really, these eBay criminals aren't going to care if the images they are stealing are registered somewhere or not. They know that, at worst, eBay may pull their listing, and then they will just sell their trinkets somewhere else. At the cost of mounting a legal action against them (especially if they are based in a foreign country), it would not make financial sense for the artist to go after them. Chris and newvillefan like this. That's why I'm a moderator here - and not a lawyer! That ebay listing is from the UK and if you look they are also selling watches with faces of Freddy Mercury (not sure if that pics is also copyright protected) It sure brings up a lot of questions but it hits close to home when one of our own is affected by using his artwork to make a profit. Seriously, my earlier postings were all suppositions. As I said, I only know of Chris Tassin through our forum here and I've seen some of his drawings and YouTube videos. I know nothing regarding any copyrights he may have, whether or not they've been published - or not. It's not my "thing". I've always concentrated my Carpenters enthusiasm on recordings, and nearly always official ones. This thread has had several examples of members falling for bootleg and counterfeit items and I've attempted to steer them straight, as I always do. If my efforts are perceived as a "whiter than white brigade", then that says a good deal about those who do. People are going to do what they're going to do. I can't stop them. But I can offer advice. CraigGA and John Adam like this. My issue is not with what you`ve pointed out already, I`m well aware of copyright issues etc on peoples items, but what I object to, is people aiming the rod at me over a watch, when the very same thing goes on here almost daily! A link has been posted to the video on YouTube of the Christmas Memories DVD, so should it be argued that that poster is `aiding and abetting`criminal behaviour by doing so, because whoever has uploaded the video, is depriving PBS of money from the sale of the DVD, because now, folk can watch it for nothing and the same applies to any other video that's uploaded to YouTube, but I fail to see any arguments regarding that!! The YouTube argument is a totally different one, and we've had our rounds of disagreement about that too. That's not what this has been about. You are treading on thin ice here and I'm placing a warning in your file. I'm suggesting nicely that you drop this whole thing and move on. If you fail to do so, we'll take stronger action. Harry ... and the A&M Corner moderating team. From Brass to Gold, Volume II: Discography of A&M Records and Affiliates Around the World (2000). Does anyone have both of these volumes (I: USA) and (II: Affiliates around the world) ? Hi all. Just wanted to update you that the seller of the wristwatches with the Karen "Little Girl Blue" drawing on it contacted me and apologized for using the image without permission and said they would no longer list it in the future. I think that was very decent and good of them. He said one of the buyers let him know that the drawing was not public domain and was one of mine. Thank you for doing that. Also wanted to add that every one of you made some valid and good points in this discussion regarding the situation and question of rights. This really is gray area in some respects, and I felt particularly on the fence about it even more so when considering that some people received their wristwatch and were enjoying it. This was just about feeling strange over it as more and more of my art has been lifted without permission for various items of late (not just Carpenter art). It's nothing new. But I realize that it's not being done with any ill intent. For me, it's not about money or wanting to covet these images of the artwork as I did them as tribute. It's more about being asked and given a name credit when they are put to use on something outside of merely showing the art and sharing it. Anyway, thanks everyone, for looking out for me, for the suggestions, and your help. Jamesj75, CarpentersToYou, Kacfan and 3 others like this. Thanks Chris. We appreciate the update and getting your input on the matter. I posted under the Hal David PBS thread that they are running Close to You Again on some PBS stations. 3 new short interviews with Richard during pledge breaks by TJ Lubinsky about the RPO sessions. New merchandise with pledge $$, the RPO cd and a Carpenters coffee mug. White mug and blue logo with song lyrics on opposite side. $60.00 pledge. 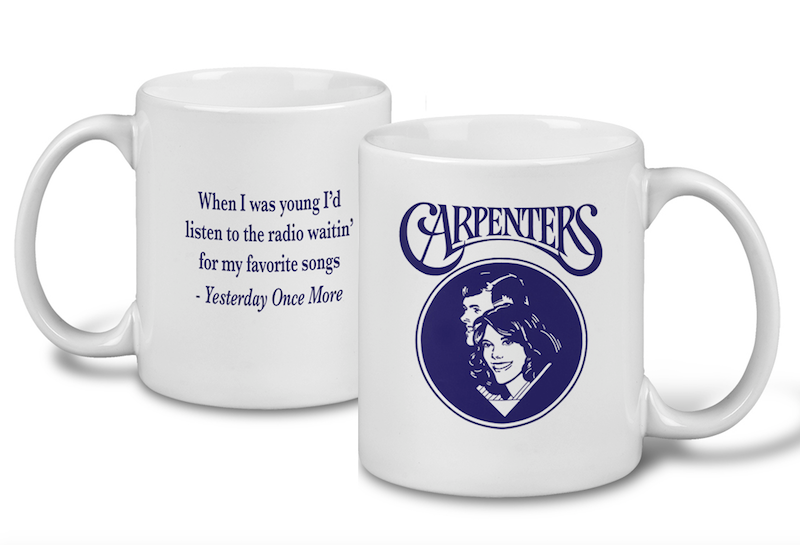 Here is a nice pic of the Carpenters Mug for a pledge to PBS. It looks pretty nice!! GaryAlan, Jamesj75, Geographer and 3 others like this. @Rick-An Ordinary Fool - What is the link to that site? I found PBS.com but did not see any Carpenters items. Thanks!